We have some hotels in Barcelona for Sale. Our Service is based to put in contact the saler with the purchaser. We make a visit and participate and colaborate to provider the best conditions both for the purchaser as the saler. For theses operations the best confidencialy is needed. According to data published by the Gremi d’Hotels de Barcelona, the pace at which new hotels are being opened in the city is showing double-digit growth. Over the past six years, 65 new hotels have been opened in Barcelona. This has doubled the number of establishments since 2000, to the current 352 hotels. Furthermore, according to data published by financial and strategic consultancy Irea, the city of Barcelona has become the third most popular destination for international funds to invest in hotels, just behind London and Paris. According to this data, 2013 has been a turning point and so far this year 235 million euros have been spent here to purchase hotels, six times more than in 2012, accounting for 63% of all operations in Spain. The consultancy ensures that these international funds don’t want to miss out on the opportunities in the current market, which show between 6.5% and 7.5% return. In this regard, the most significant transactions carried out this year have been Diagonal Port hotel and the W Hotel. Finally, Irea concludes that demand has grown at the same pace as new hotel rooms, and that large hotels are no longer being built as the sector is now focusing on smaller establishments with eighty or ninety rooms. The hotel division of CB Richard Ellis expresses similar sentiments, confirming that international real estate and private equity funds are looking for new operations to invest in hotels in Barcelona as a global benchmark in tourism, and affirms that the location of the project is key for investors. International tourism (83% of visitors), which combines leisure and business above holiday tourism, makes investment projects safer and more stable. 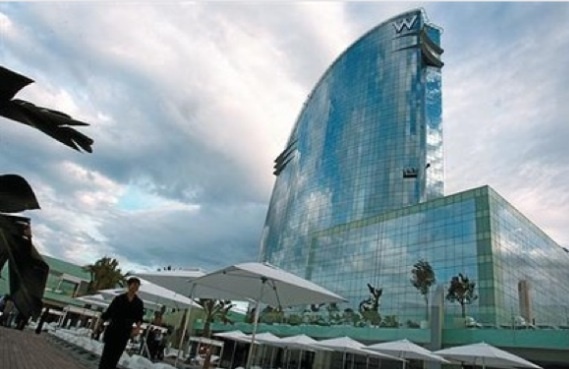 The Hyatt hotel group will land in Spain with a hotel located in this emblematic building in Barcelona. Emin Capital has purchased the Agbar tower to turn into a five-star gran luxury hotel, as well as a luxury leisure center. The plan designed by the hotel group includes an important investment to transform the building, which is currently used as offices.